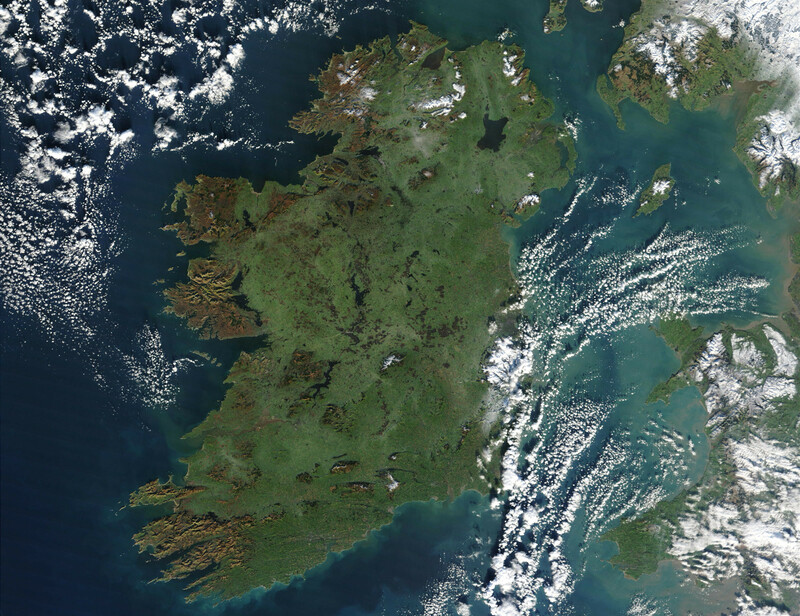 Many people in Ireland yearn for a change of government, to one that would govern in the people’s interests and not renege on electoral promises once they enter Dáil Éireann. A noble dream it may be, but how real is it? 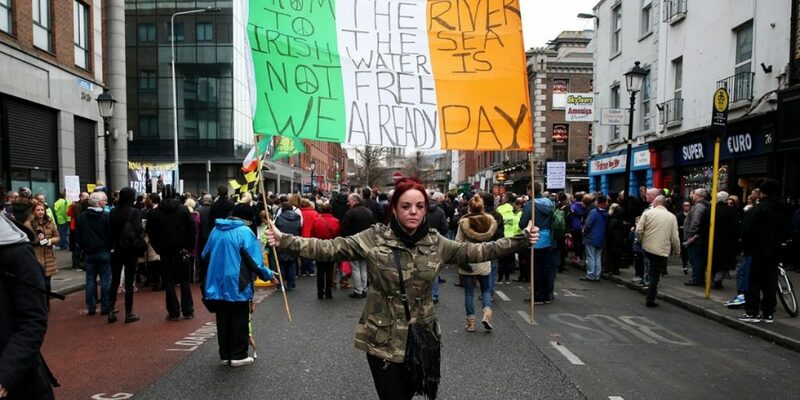 Let’s briefly look at the Right2Water campaign. 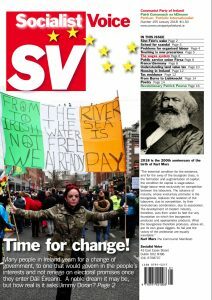 The CPI recognised from the start that the class element of the water question was ownership—not water charges. It would be the ownership of that resource that would challenge capitalism. It was the largest mobilisation of citizens for many years against a government policy, it was well supported, and eventually forced the issue onto the floor of Dáil Éireann. Alas, once there it became lost in the swamp of the committees and internal investigations that dog every progressive policy that finds its way there—as is intended. That is the system. What are the results and findings of these committees of investigation? Sadly, it’s not what we wanted and fought so hard for. There will be no referendum on ownership, water charges will be brought in through the back door by means of “excess usage charges,” and Irish Water is still intact. So when the Government gets more confident and regroups it will continue on its neo-liberal journey, free to sell off Irish Water to big business at a time of its choosing. This is how our democracy works. What are we to learn from this “victory” on water? We should learn who our democracy works for. Is it for the people or those those who sponsor and control it—i.e. big business? If we use water as an example, the answer is quite clear; and now is the time for change, and it is time to change this failed system. Does this mean that if we change the make-up of Dáil Éireann, i.e. the parties, and have a working progressive left government, things will change in the interest of the common good? Should that be our aim? Would this, or could this, lead to any real change? I think not. Since the foundation of the state almost a hundred years ago we have had various arrangements in the Dáil, but all had one thing in common. This remains today, whoever they are: the establishment parties, Sinn Féin, the Green Party—from the left, the right or the centre, apart from a tiny minority of candidates, they all want to maintain capitalism, not to smash it. And the people who vote for them are largely of the same belief. They may talk of change, wish for change, dream of change, even vote for change, but deep down they want the system to remain the same, if a little bit fairer. But there is no such thing as a nicer, fairer capitalism, as its foundation is greed and profit. Our task is to change that outlook. It’s not reforms that are needed, it’s real, qualitative and transformative change for our citizens, which will empower them, not quantitative changes, which will make things easier while the balance of forces remains unchanged. The battle over water is for ownership, not how we pay for it. With housing it is all about ownership too. The CPI has continually and consistently called for public ownership of housing: public housing, built by the state for our citizens, available to rent by them if they so desire, just as the state should provide public health, education, transport etc. as a right to all citizens. Many groups on the left have been convinced by the “cost-rental model” for public housing, which is liberal capitalism’s answer on how to water down the demand for public housing and allow it to compete with the market, rather than challenge the market to its very core by bringing into state ownership the provision and building of homes for all citizens. We don’t look at public health or education and ask how they should be self-financing from day to day. They are self-financing in the effects they have on our society, by looking after the health requirements and educational needs of our citizens so as to allow them to fill a productive role in their life and reach their full potential. Why should housing be any different? Such a policy, by providing safe, secure homes for all citizens, will remove the effects of substandard homes and the precarious nature and uncertainty of private rented accommodation that is the reality of today. This, along with the extra money in people’s pockets, now free from the strangulation of property debt, will benefit civil society immensely. The challenge is to change the prevailing view on the manner of housing our citizens: to win that ideological battle, where nothing less than universally accessible public housing will be acceptable by the people, thus forcing a change in demand from something like “social housing,” which supports capitalism, to one of universally available public housing, available to rent according to ability to pay, that challenges the system and will bring about a real transfer in the balance of power from the landlord class to the citizen. Some on the left seem obsessed with how such a system is to be financed within the confines of capitalism. The answer is to give priority in state budgets to building the required homes as part of a permanent housing programme—instead of working out new ways of letting business escape paying taxes on the surplus wealth that the citizens, their workers, produce daily in their businesses. If they want to make use of our labour they will have to contribute to a safe, secure home for their workers, not to leech off us in their never-ending greed for extra profit and in tax avoidance. If we are to defeat capitalism we must expose and exploit its weaknesses. This will not be done in Dáil Éireann: it will be done in the hearts and minds of our citizens. Only then can we truly have change that will allow all our citizens to fully benefit from the fruits of their labour. In recent years, as capitalism has gone into overdrive, those weaknesses are becoming more and more obvious, with inequality going to levels not seen since the Industrial Revolution. Back then we settled for higher wages and better working conditions and a larger share of the wealth we produced as part of our struggle—only to see it all taken back, bit by bit, in the intervening years, to a stage where once again workers can’t afford a roof over their heads on the wages paid to them by employers. Which goes to prove that any gains under capitalism are always only temporary, and at someone else’s expense. The time for change is now. It’s a battle to lay bare the class nature of society as it exists today. The Government will not change the system; the transformative demands of the people can be the spark to tip the balance back in our favour.